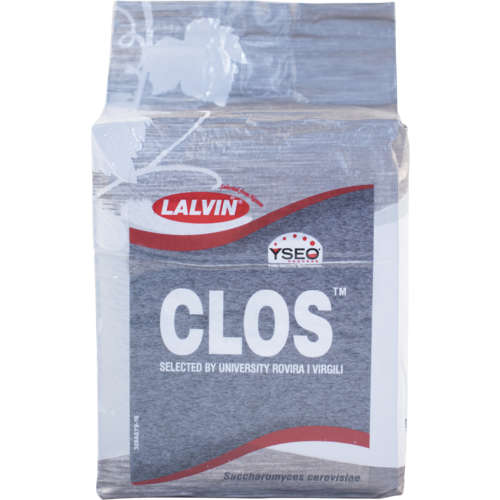 Clos is a new yeast strain that was recently isolated in the Priorat region of Spain. Clos was chosen for its ability to re-enforce structure while emphasizing aromatic complexity and mouthfeel. Sweet red fruit (cherry), with pepper and chocolate notes are typical of what Clos brings to a fermentation. With hot climate/high Brix fruit, Clos is a great choice for its high alcohol tolerance (17%), low Nitrogen needs and short lag phase. Clos also does well with higher fermentation temperatures (max 95 F) and shows a good compatibility with MLF. Highly recommended for Syrah, Petite Syrah, Grenache, Tempranillo and Carignane. intend to make a full bodied red from a cab sauve and petit veerdot blend and this yeast helps produce the desired wine style. Never had a bad batch of tempranillo using this yeast. I found myself with an over-ripe late harvest syrah. There had been some puckering and dehydration of berries and after harvest I was shocked to get a brix reading of 31. Yes, thirty-one brix. Watering back could be done to get me back in the realistic range, all the water would not make for a very good final wine. I solved my problem my mixing in a good bit of low brix. low ph grapes from another vineyard. A bunch of 31 brix cut with some water and some 22 brix grapes dragged me down enough that I had about 27.5 to 28 brix must. That is when I went to the CLOS and crossed my fingers. I hoped for a full ferment, no stopping, no stressed yeast and something I could work with after all was done. The CLOS did the whole job. It fermented to dry. It left no residual sugar, and yes I tested for sugar. It did not stop. And it did not get stressed and produce sulfur. I did take action to avoid stuck ferment and that might have been part of my success. But the end result is a darn fine, high alcohol, big mouth feel, dense-deep red violet wine that I am pretty proud of. So, yes, if you are considering CLOS. I recommend that you try it. Clos has fermented several batches for me and I have been very pleased with the fermentation and the flavors. Used to ferment a high YAN (350) lot of Lodi Tempranillo. Fruit was clean and came it at 24.9 Brix. Cold soaked for 3 days then inoculated with GoFerm Protect. Fermentations had very short lag and just took off in a blaze. Mid fermentation temps rose into low-mid 90s and began exhibit some off aromas, so additional punch down was added to get some more oxygen introduced. Overall yeast performed very well, with nice varietal expression. Just make sure you get nutrients in quick, and watch the temps to avoid stressed yeast or cooked aromas. This fall (2013) I used Clos for both my 100% Barbera and my Bordeaux Blend (70% Cab Sauv, 15% Merot, 15% Malbec). It started quickly and has gone to completion. I also provided the fermentation with two feedings of Fermaid.